The 340B Drug Pricing Program allows certain hospitals and other health care providers (“covered entities”) to obtain discounted prices on “covered outpatient drugs” (prescription drugs and biologics other than vaccines) from drug manufacturers. Manufacturers must offer 340B discounts to covered entities to have their drugs covered under Medicaid. The discounts are substantial. The Health Resources and Services Administration (HRSA), which manages the program, estimates that covered entities saved $3.8 billion on outpatient drugs through the program in fiscal year 2013. 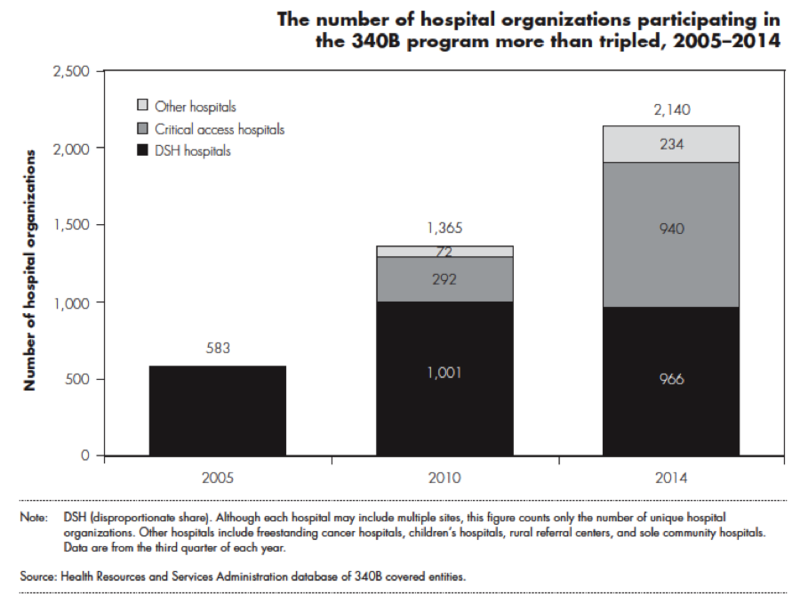 According to HRSA, the intent of the 340B program is to allow certain providers to stretch scarce federal resources as far as possible to provide more care to more patients (Health Resources and Services Administration 2014e)…we estimated that, on average, hospitals in the 340B program receive a minimum discount of 22.5 percent of the average sales price for drugs paid under the outpatient prospective payment system. Which providers qualify for the 340B drug discounts? Examples include federally qualified health centers and Ryan White grantees as well as hospitals that are located in remote regions [critical access hospitals (CAHs), rural referral centers, sole community hospitals], and hospitals that treat vulnerable populations such as disproportionate share (DSH) hospitals, children’s hospitals, and freestanding cancer hospitals. Do most hospitals quality for the 340B program? About half of hospitals (45% of Medicare acute care hospitals, according to MedPAC) qualify for 340B drug discounts. However, there has been a steep increase in the number of hospitals participating over time. Can hospitals get discounts from the 340B program and Medicaid for their Medicaid patients? In short, no. HRSA rules prohibit these double discounts. To avoid duplicate discounts, a covered entity chooses whether to “carve out” or “carve in” Medicaid patients. If the entity carves out Medicaid patients, it provides non-340B drugs to these patients and the state Medicaid program is permitted to claim rebates on the drugs. If the entity carves in Medicaid patients, it provides 340B drugs to these patients and the state Medicaid program is not allowed to claim the rebates. What do key stakeholders think? In recent years, there has been a debate between 340B hospitals and drug manufacturers about the proper scope of the program. Manufacturers have questioned whether all of the hospitals in the program need discounted drugs…Manufacturers seek to narrow the program’s focus to helping patients who are poor and uninsured gain access to outpatient drugs. In contrast, 340B hospitals seek to preserve the current criteria for eligibility for the program and their ability to use revenue generated through the program without restrictions. Do drug manufacturers have a case? Maybe yes. MedPAC states that Medicare pays the exact same amounts for Part B drugs to 340B hospitals and non-340B hospitals. However, the cost of these same drugs to 340B hospitals are much lower due to the deep discounts. For instance, Medicare Part B may pay $1,000 for each fill of a given drug. The cost of non-340B hospitals to access that drug may be close to $1,000. For 340B hospitals, however, the cost of the drug would be only $775 (based on MedPAC’s estimate of discounts) and thus taxpayers are overpaying for these drugs.